Anthony Downs was established in 1904. Although illegal betting was conducted through the years, pari-mutual wagering didn't happen until 1992. Anthony Downs was kind of unique for the fact that when it ran races, which was something like two weekends a year it mixed thoroughbred, quarter horses, and dog racing on the same card. The dog track was in the infield of the horse track. 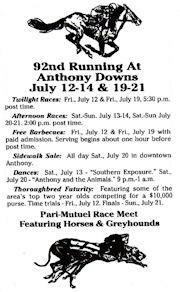 In 2009 Anthony Downs ran it's last pari-mutual meet, as pari-mutual wagering was again outlawed in Kansas. The track returned for one more year of non wagering racing in 2010 before folding the tent. As of 2012 the track has been demolished to provide housing for workers who are streaming to Kansas to work in the newly discovered oil fields there.